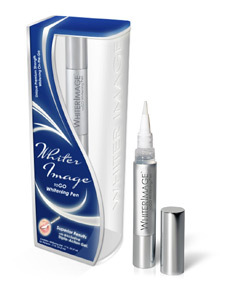 The Whiter Image To Go Whitening Pen offers the hottest new way to whiten your teeth on-the-go. The unique advanced whitening pen provides convenience, results, and a look that will turn almost anyone's eyes. It's as easy as 1-2-3. Click-it, Apply it and Smile! Triple-Action Accelerator Gel for your quickest, whitest smile.